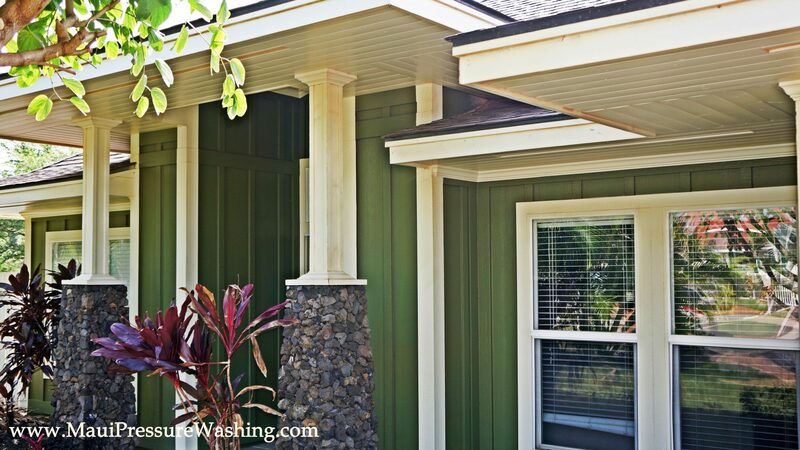 We have been pressure washing Hawaii homes for quite some time now and are always happy to have return customers, like our friends in Haiku. For the third time we have been trusted to care for another part of their property, the concrete. We performed lots of concrete pressure washing in 2014 and plan to clean even more in 2015. Thanks to our friends we are off to a good start. Previously we had pressure washed three homes on this property, including the gutters, so we were glad they liked our work. Below is a picture of the halfway point on this section of driveway that we performed power washing on. Call (808)463-7166 to have this service performed on your home. 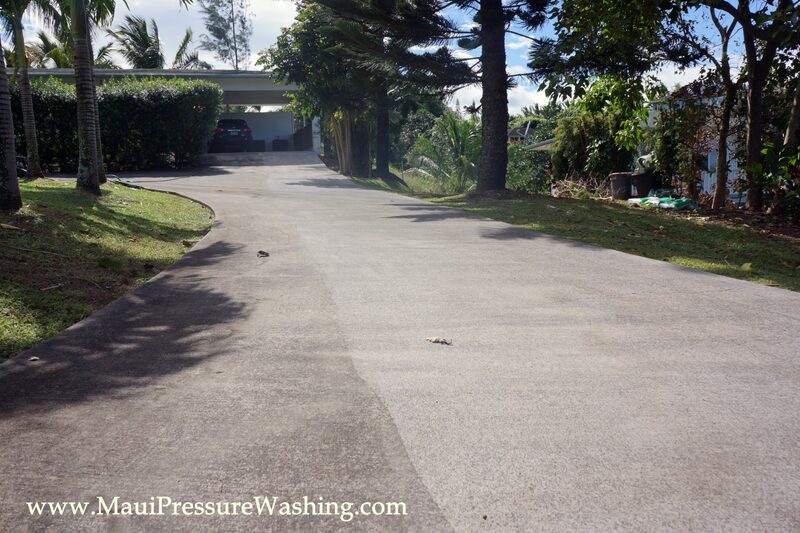 Also to start off the year we had a new customer call us about performing Maui house cleaning, one of our most popular services for pressure washing Hawaii. We are extremely detail oriented when it comes to cleaning homes, and we would love to prove it to you! We prefer to use minimal or no chemicals, and NEVER use chemicals that we believe will harm the coral reef, or have major adverse effects on the surrounding environment. Cleaning the lanais is often part of the deal, so we have no problem bringing that equipment along to perform an excellent cleaning on your patio. 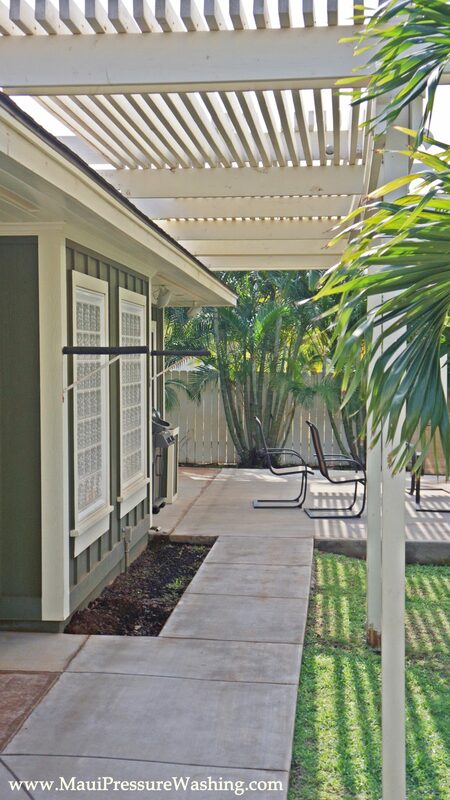 The pictures below show some of our excellent pressure washing work on a home in Kihei. Kihei house cleaning is one of our most popular services. Please call (808)463-7166 to get a FREE estimate on having your home or driveway cleaned. We would be overjoyed to help you clean your home for a reasonable, affordable price. cleaning driveway Maui, concrete cleaning, Haiku power washing, Kihei power washign, power washing driveway, Pressure Washing Hawaii. Bookmark.